The best and the closest driver training venue to Brisbane. The aim of the course will be to provide post licence driver training to improve skill levels. This one-day Defensive Driving Queensland Level 1 course is suited to all drivers of regular passenger vehicles, including four-wheel drives and light commercial vehicles. The mix of practical and theoretical components of this advanced driver training session deliver actual on-road safety skills that underpin proactive driving. Young drivers are strongly encouraged to develop better on-road defensive driving skills and more solid techniques, but more experienced drivers also benefit enormously from advanced driver training, including the correction of old habits and improving judgement and reactions. The Defensive Driving QLD Course provides a combination of practical and interactive class sessions in actual on road safety skills. They are specially designed to educate drivers of the risks associated with driving, and skills needed to avoid accidents. 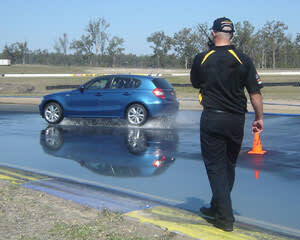 The courses encourage proactive driving aimed at improving community road safety. Your instructors are selected not only for their abilities as a driver but also their ability to effectively communicate. All instructors are hand picked by Chief Instructor Paul Stokell, a five time National Champion who has been educating drivers for over 12 years, working not only in his own company but regularly with many proactive vehicle manufacturers both in Australia and Overseas. Defensive driving was very informative would have preferred more practical to consolidate the theoretical. Staff on the day were very helpful and knowledgeable, any question were answered quickly and completely. The course was informative, interesting and fun. I will definitely be looking into doing the second level course. Really enjoyed my day at the Defensive Driving course at Mt Cotton. Learnt so much in just a short amount of time really and left a lot more aware of other drivers' actions and my own car's capabilities, which I hadn't had a chance to really discover out on the road. The instructors (Ian, Levi and Greg I think) were great. Very patient and clear in their instructions and expectations. Would highly recommend this course to anyone. It should be taught when getting your licence in the first place so drivers get good habits to start with. I'm eager to do the next more advanced course later in the year. Glad that I already do some of the things/skills shown in course, but boy did I get an awakening of just how arrogant a driver I'd become. THANKS for the salient lesson fellas! I've changed some bad habits already! I learnt so much with the time I spent with the team, I love the experience. The leaning environment was amazing and I left feeling like a much more confident driver. Had a really informative day especially enjoyed the driving side of things. A fantastic day where I learnt a lot. Thank you for an awesome day. The practical side of the course was very valuable. The theoretical side was very irrelevant and based on the opinions of the facilitator and provided very minimal benefit. This could have been structured and presented far better.